Win a Free Space in My Next Online Workshop! Share your favorite online workshop with on Facebook, Twitter or Pinterest and leave a comment below. Click here to view the four classes I'm currently offering, click on the classes to use the easy social sharing buttons. Make sure I can reach you through your blogger profile if you win! The class you share can be one you'd like to take or one you've already taken. A winner will be selected randomly from the comments on Tuesday at 12pm EST. 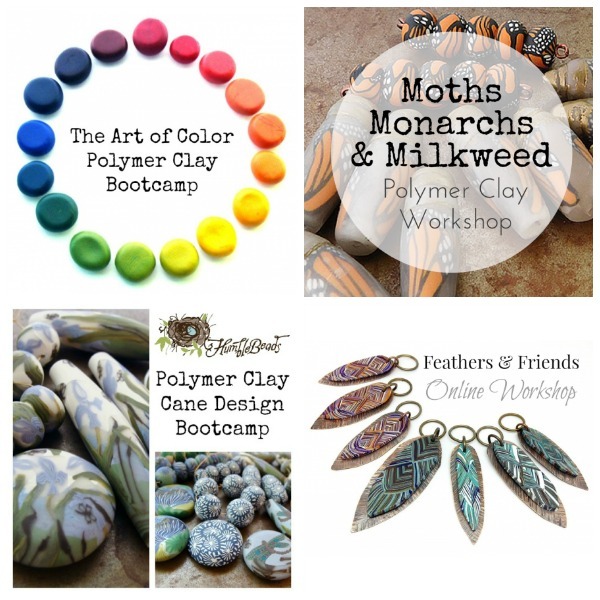 Free registration to my next online polymer clay workshop! Registration for all workshops are currently re-opened and on sale. Save $50 off the Art of Color, Cane Design Bootcamp or Moths, Monarchs & Milkweed and $10 off Feathers & Friends. Use code CLASS20 to save $20 off any two or more $75 classes. Classes are self-paced with life-time access to the step-by-step videos and instructions.